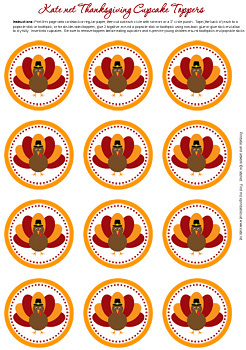 Original and exclusive Thanksgiving cupcake or dessert toppers from Kate.net! In order to download this sheet which is in PDF format, you'll need the free Adobe Acrobat Reader. Most people already have this on their systems. Click on the image provided to open the page. Then, once opened, either click on the printer button within Acrobat to print the page, or go to the 'File' menu and select 'Print.' For best results, print on card stock. Cut around the perimeter of each cupcake topper circle with scissors (or use a 2" circle punch), then tape the back to a popsicle stick or toothpick. For double-sided toppers, use non-toxic glue or glue stick and glue 2 of the circles back-to-back around a popsicle stick or toothpick and allow to dry fully. Insert into cupcake. Be sure to remove toppers before eating cupcakes, and always supervise small children around toothpicks or popsicle sticks. These cupcake toppers are © Kate.net. These pages may be printed for personal or school use; however, they may NOT be offered or distributed elsewhere in any format, whether commercially (for a fee) or for free, NOR may portions of these pages be modified or used in other graphics. You may NOT link directly to these downloads; however, you are welcome to create a link to this page's URL. Thank you! Click here or on the picture below to open up the PDF file. Then, just print! For best results, print on card stock.